Explanation: Catching sight of your reflection in a store window or shiny hubcap can be entertaining and occasionally even inspire a thoughtful moment. So consider this reflective view from 300 kilometers above planet Earth. The picture is actually a self-portrait taken by astronaut Michael Fossum on July 8 during a space walk or extravehicular activity while the Discovery orbiter was docked with the International Space Station. 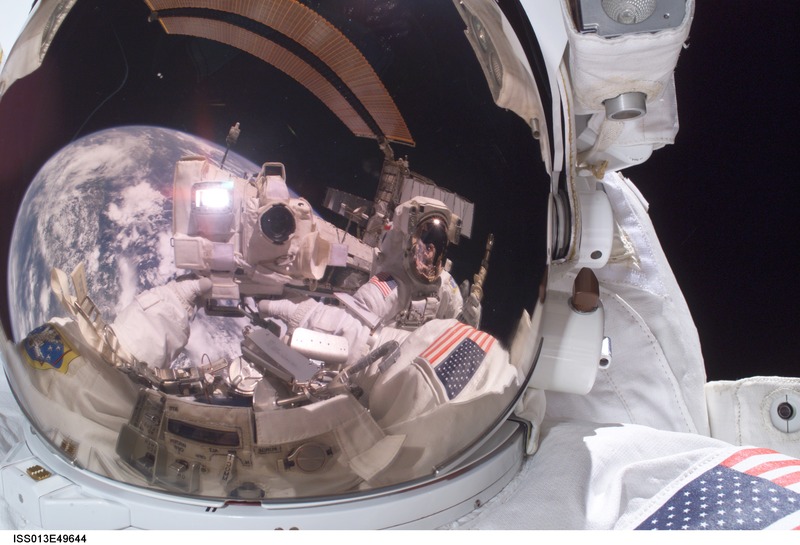 Turning his camera to snap a picture of his own helmet visor, he also recorded the reflection of his fellow mission specialist, Piers Sellers, near picture center and one of the space station's gold-tinted solar power arrays arcing across the top. Of course, the horizon of our fair planet lies in background.